These Mava Sport knee sleeves with elastic style compression have really impressed me so here’s my review on them. 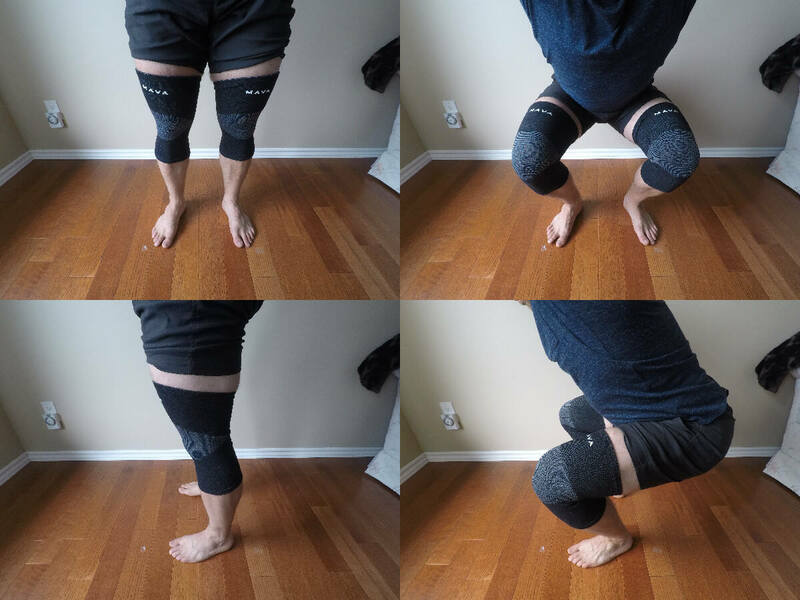 They’re not the traditional neoprene knee sleeves you see in the gym for squatting – it’s a different angle they’re taking with a different material. You can certainly use them for squatting and I personally like them quite a bit for squatting and regular gym workouts. These aren’t super heavy duty sleeves but they fit around the knee very nicely, have some anti-slip material on the inside, give a nice amount of compression, they’re super comfortable, and they feel great. My initial impression of these knee sleeves was great, they’re surprisingly comfortable for the price I didn’t expect that at all. Putting the knee sleeves on is easy and yet they sit snug on the knee due to the shaping of the sleeve. The elasticity of the sleeves gives a good bit of compression, warmth, and support to the knee and leaves you with full mobility. These are of course what I would call light-duty knee sleeves – they’re not going to add a ton of weight onto your squat. They can however, keep the knees warm and compressed and keep you safe while lifting. They may inspire a bit of confidence while lifting that WILL allow you to mentally get passed some barriers and maybe squat some more weight. Made from bamboo, spandex, and latex these are a comfortable and stretchy sleeve. They wear well and the material feels good quality, however due to the woven design there is naturally risk that the material could tear or start to pull. If nothing like that happens, these knee sleeves could last for a good long while. I would also be careful while washing them as you don’t want to damage the seams at all or else the sleeves might start to pull apart. Overall for the price the material quality is good, the construction is well thought out, but there could be some long-term durability issues due to the woven/knitted design. Some people may opt to work out in these sleeves, but I think most would be looking at them for injury recovery, daily usage while working a manual labor job, or for running and general athletics. If you do want to wear them in the gym they’ll provide you with comfort, a bit of compression, and they’ll keep your knee joints warm. For injury recovery these sleeves are great they’ll protect you while improving your circulation to and around the knees. You’ll hardly notice them there and will be able to wear them for extended periods of time during your recovery period. The same for everyday usage while working – these sleeves will give you the boost you need while not being invasive or uncomfortable. For general athletics and sports usage like running or basketball – these are perfect and I think this is where the sleeves excel. They’ll keep you tight and safe, not restrict mobility, and you don’t have to adjust them all the time as they’ll stay in place. Win, win, win. Overall for the price it’s hard to go wrong with these knee sleeves. Whether you want a light duty pair of sleeves for squatting, a reasonably priced knee sleeve for recovery, or you want to wear a comfortable sleeve all day long while you work – give the Mava Sport knee sleeves a chance, I would personally recommend them for these uses.